They all come from this. As kings and queens of the moment. Fill our vessel to the brim. Better by far to live like this? Is all we could ever wish for. Scott, these lines are beautifully alive and poignant. Isn’t it marvelous how some of our best stuff comes forth in paeans to other poets. Dylan Thomas would most certainly have been moved by this gorgeous, inspired poem, Scott. I have a renewed sense of perspective and optimism in its read. Such beautiful transition and deeply personal connection. What an insightful commemoration! I always enjoy reading your impressive poems, Scott! Thank you. Dylan Thomas would be so proud. it has a richness, a conciseness we all need now. Scott once again excellent…Dylan would buy you a beer! A complete condensed trip – birth to angels Love it! The horses on Hudson Street threw him mightily to the ground. He kept getting up and shouted his curses to the defeated ones. Only winners are ever wanted at the bar. Thank you Scottie for the splendid verse. Beautiful work filled with heartfelt emotion. 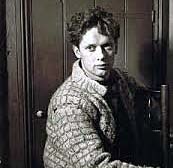 Wonderful tribute to Dylan Thomas, one of the starry legends from English Literature. A real pleasure to read, Scott! Thank you for this amazing work. Hats off to you great poet! A very fitting tribute to Dylan Thomas. Further to Susan’s comment above, he would probably have bought you two beers! I reminisce about the times I have had a jar within the gaze of Dylan Thomas, looking back at me from his mural at the White Horse tavern, the scene of his last drinking binge before passing away at St.Vincent`s hospital days later. It also makes me think of Jack Kerouac, a skeleton in drink who passed at 47.
fully absorbent fueled by good faith. Such a serene and peaceful poem. I really, really like this poem. Upon reading your words, Scott, I am always stricken by a sense of peace and balance, inspired by the great potential of your verse and keenly engaged. How remarkably fine to close this piece in this way; beautiful. “contentedly” as the poet says.